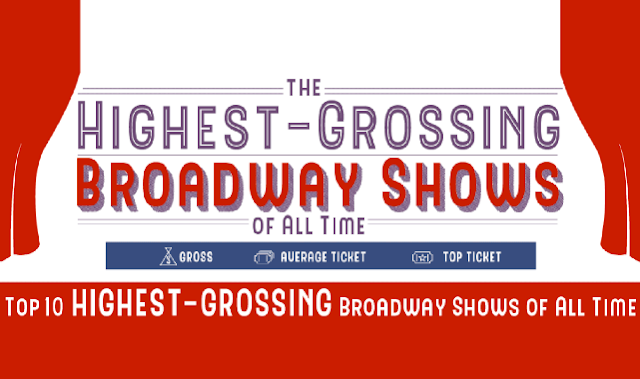 The Highest Grossing Broadway Shows of All Time #infographic ~ Visualistan '+g+"
“The Great White Way”. Despite today’s digital dominance, Broadway continues to earn astonishing success. The 2017-2018 season was the most successful of all time, with a total attendance of 13,792,614 and grossing $1,697,458,795 in profit. This infographic celebrates the highest-grossing Broadway shows of all time. It also highlights the Broadway shows with the longest runs, the most expensive top tickets, and the most expensive overall tickets.